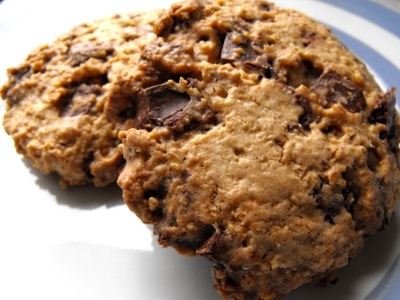 This oatmeal chocolate chip cookie recipe has a lovely Christmassy flavour. If you add walnuts, almonds peanuts, raisins, cranberries or other dried fruits and nuts instead of chocolate chips you can increase the healthiness of these cookies even further. Different spices like nutmeg and cinnamon could also be added. I reduced the amount of sugar because lately I have not liked overly sweet treats. So there is only half a cup of sugar and only half a cup of butter. When I made these I was a bit overly ambitious because I love the idea of eating extremely large cookies mine turned out quite large a bit too large actually. That however didn’t stop me from eating more than my fair share. If you want to get more cookies out of the dough you can easily make 18 smaller cookies which are equally as filling but you may have to keep a close eye on them to make sure they do not burn. The ingredients make 9 large chocolate chip cookies or 18 small cookies. Get new recipes and insights with our monthly e-zine. Preheat the oven to 180C°. Convert! Place the softened butter into a bowl and mix it together with the sugars and the desiccated coconut until a creamy consistency is achieved. Then add the egg and the vanilla essence and mix well. Add all of the dry ingredients the flour, the baking powder and the salt and combine gradually. Lastly stir in the oats and fold in the chocolate chips. I ended up just chopping up a block of chocolate because someone had eaten all of the chocolate chips this resulted in larger chunks of chocolate in my cookies which is a bonus in my opinion. Bake for 15-20 minutes at 180C°. There are those that keep for weeks and weeks. These are often baked in preparation to the Christmas holidays. The there are those that go into lunch boxes or aside of a cup of hot chocolate or tea. And then there are those cake type cookies often mixed with some vegetable like pumpkin, sweet potato or zucchini, that are great as dessert. When do you eat cookies? Do you have a favourite recipe you bake sometimes? Share it, buitl its own page and include up to four pictures to document how to do it. What is Your Favourite Recipe? Do you have a favourite recipe? Share it! Your recipe will appear on a Web page exactly the way you enter it here. You can wrap a word in square brackets to make it appear bold. For example [my recipe] would show as my recipe on the Web page containing your recipe. Important Note: The maximum image size accepted is 800x600. Please, resize any photo larger than 800x600 pixels using your graphics software or a Web-based resizer, such as Picnik. I promise to use it only to send you Food To Grow. All recipes have been tried and tasted by me and my family. Copyright © 2011-2015 Mariam Cisse. All rights reserved.